Nick on IT: 3CXPhone for iPhone available via Appstore! 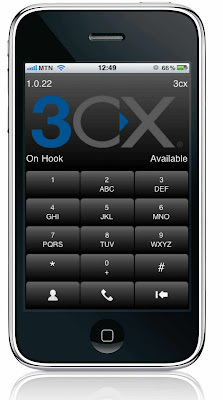 3CXPhone for iPhone available via Appstore! We finally released 3CXPhone for iPhone - the first free SIP VoIP Phone for iPhone that does not tie you to a particular PBX or VoIP provider. It took us a while - iPhone development is not trivial and we also wanted to have a good first version. 3CXPhone for iPhone shines with its provisioning feature - users of 3CX Phone System can have the phone automatically configured without having to worry about SIP authentication IDs, SIP server details and so on. This is a great help for administrators and users. 3CXPhone for iPhone turns an iPhone 3, 3G or 4 into a great wireless deskphone alternative. We plan to add features that will make use of iPhones as extension phones within companies easier.